I thought you might be interested in this sales update for Australand’s Watermarque precinct within its $500 million Hamilton Reach development. More than $120 million in sales have been achieved to date and only three two bedroom apartments remain for sale in the boutique precinct. The apartments have proven popular with downsizers looking to sell their existing homes and relocate to an inner city, riverside luxury address. The trend has been backed by Place Advisory’s Market Report on Inner Brisbane Apartments, which reported downsizers were beginning to influence the off-the-plan market for the first time since the GFC, demanding larger and higher quality stock. The report showed two bedroom apartments accounted for the highest amount of inner Brisbane apartment sales in the June 2013 Quarter, with 48 per cent of unconditional sales registered. Place Advisory’s Lachlan Walker said the highest number of sales was recorded in the Inner North, which includes the suburbs of Hamilton, Fortitude Valley, Kelvin Grove, Bowen Hills, Newstead, Albion, Milton, Toowong, Bowen Hills, Tenerife and New Farm, which was a positive indication local confidence is returning to the Brisbane off-the-plan market. 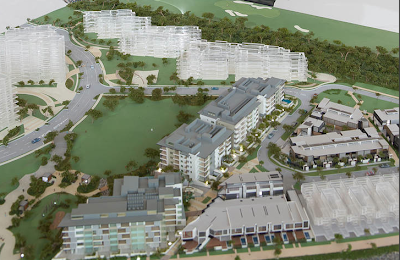 Watermarque will feature 78 apartments across two medium-rise five-storey buildings. The three remaining apartments are priced from $635,000 - $710,000.